Researchers from North Carolina State University have created elastic, touch-sensitive fibres that can interface with electronic devices and be applied into sensors. According to NC State, the new fibres are made of tube-like polymer strands that are a few hundred microns in diameter and contain eutectic gallium and indium (EGaIn), which is a liquid metal alloy. Each fibre consists of three strands with one completely filled with EGaIn, one two-thirds filled with EGaIn, and remainder one-third filled with EGaIn. The tubes are then twisted together into a tight spiral. The touch-responsive fibre is capacitive and works in the same way as touch screens on smartphones. Capacitance describes the phenomenon of an electric charge that is stored between two conductors and separated by an insulator. When a finger (conductor) touches the screen of a smartphone (insulator), it changes the capacitance between the finger and the electronic material beneath the screen. The smartphone’s technology then interprets that change in capacitance as a command. 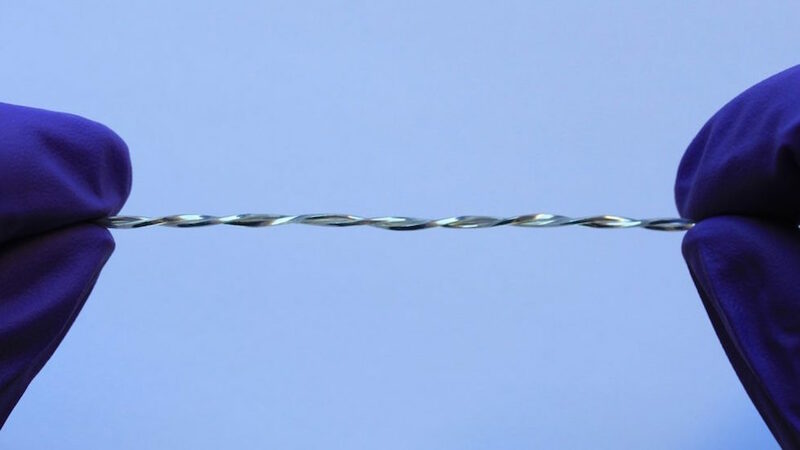 For NC State’s device, a finger touching the elastic fibre changes the capacitance between the finger and the EGaIn inside the insulating polymer strands. By moving a finger along the fibre, the capacitance varies depending on how many of the strands contain EGaIn at that point in the fibre. This gives the user the user the ability to send different electronic signals depending on which part of the fibre is being touched. The researchers also developed a sensor using two polymer strands, both of which are completely filled with EGaIn. The strands are twisted into a tight spiral. Increasing the number of twists elongates the elastic strands and brings the EGaIn in the two tubes closer together. This changes the capacitance between the two strands. The paper, “Stretchable Capacitive Sensors of Torsion, Strain, and Touch Using Double Helix Liquid Metal Fibers,” is published in Advanced Functional Materials. Great concept: but a simple caveat: one of the constant ‘fears’ in all synthetic fibres is ‘static’ -so I hope those involved are watching and allowing for this?